6 weeks might not seem like a particularly long time, but a lot can change in that time! I drove to work for the first time since I’ve been back from Broken Hill, and it felt like I was in a completely different place. What used to be a nice peaceful drive through a mini forest on the edge of my suburb, interspersed with small farms and cottages had become a piece of bare land- all the trees had been stripped down and trucks had already come in starting the building roads and houses. It’s quite sad as I was pretty proud of the last little piece of nature to survive amongst all this urbanisation, but I guess it was only a matter of time before someone realised the huge money making potential the large pieces of land could be. 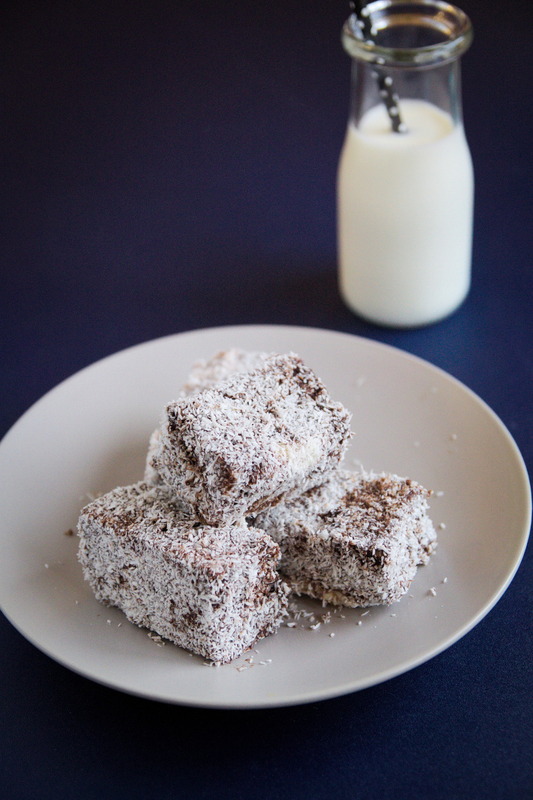 Luckily, some things don’t change at all, and this lamington recipe is a fine example of this- it’s still as trusty as ever! I’ve never been too fond of making lamingtons, because they’re too fiddly for what they are worth. After all the time spent dipping the cakes in the chocolate and then the coconut, and then cleaning it all up I could have made a much fancier cake or dessert with that effort. But curiosity got the better of me, when I saw these panna cotta lamingtons from Flour and Stone popping up on my news feed and since I no longer work in that area of Sydney, I decided to try making them instead. The recipe is your standard lamington recipe, with an extra step of adding a panna cotta batter to the sponge cake and setting it before coating it with chocolate and coconut. And what a difference it makes! You don’t really taste that it’s panna cotta as such, because you don’t get the light jelly texture when its set inside cake, but you get the rich creamy flavour of panna cotta. Everyone who’s tried it so far has been giving it great reviews- definitely a winner in my books! 1. Preheat oven to 180 degrees celcius. Grease one 9″ x 9″ cake pans and line them with greaseproof baking paper. 2. Cream the butter and sugar together until fluffy. 3. Add the beaten eggs gradually until fully blended. 5. Pour the batter into the cake pan. 6. Bake for 15 to 20 minutes, until the middle of the cake bounces back when pressed with your index finger. 7. Remove from the oven and cool. 1. Soak the gelatin leaves in cold water to soften. 2. Place the cream, sugar, and scraped vanilla pod in a saucepan. Stir and warm over low heat until sugar is dissolved. 3. Remove the gelatin leaves from the water and squeeze any excess water from them with your hands. 4. Remove the cream mixture from the heat and add the gelatin leaves. Whisk well until all the gelatin leaves have melted. 5. Strain through a fine sieve and leave at room temperature for an hour. 1. Once the sponge cakes have cooled, pour the panna cotta over the cake. 3. Cut the cakes into small pieces (I cut mine into 12). 4. Put the lamingtons back in the fridge while you prepare the chocolate icing. 6. Pour one-third of the chocolate onto a flat tray. 7. Remove the lamington pieces from the fridge, place them on the flat surface of chocolate, and spoon chocolate over the top and down the sides. 8. After letting the chocolate set slightly, press the lamingtons into the desiccated coconut. 9. Keep refrigerated in a sealed container until ready to serve. 1. I used my usual sponge cake recipe for these instead of the one in the original recipe because it was lower in butter- the recipe is already unhealthy enough as it is without the extra butter in the sponge batter! 2. I also downsized the recipe because the original recipe makes a huge batch! 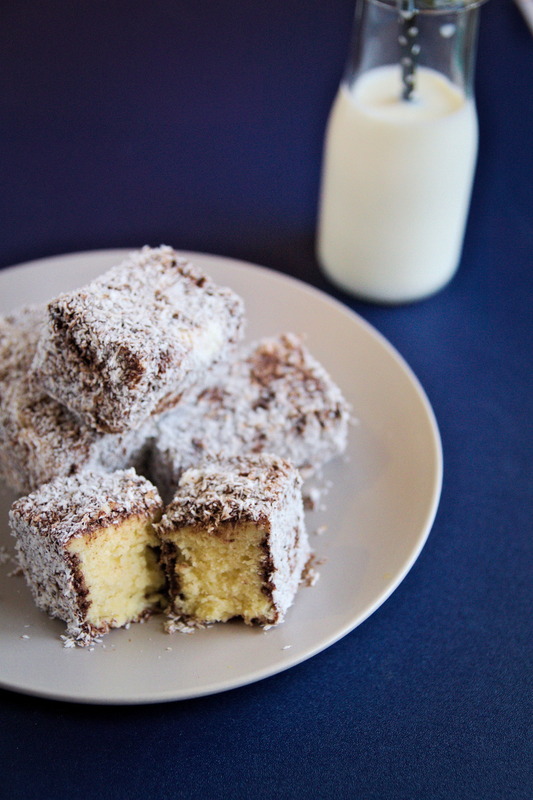 What a creative lamington recipe! The sponge cake must taste really great after absorbing the creamy panna cotta. Sad how nature is destroyed. Same story over here in the name of development. Perhaps the weather is becoming so monstrous. Made my share of lamington and glad turned out as expected. But the local version with pandan/leaves. Love this panna cotta version. Nice for the melt in the mouth texture. Perhaps the next time, I shall try out. Wow what an imaginative idea to add panna cotta to a sponge I bet that really upped the amazingness of these lamingtons.